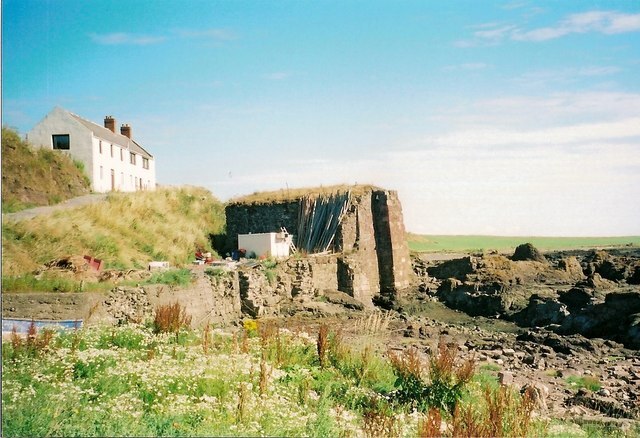 This photo shows the former salt boiling house and ice house at Fishtown of Usan in the old parish of Craig. Since the 15th January 1980, it has been designated a Grade C (S) listed building. This building is the sole survivor of three salt pans at Usan which were in use by 1798. Sea water was trapped in a rock basin and, particularly in summer, evaporation increased the salt concentration of the brine. A channel was cut through the rock to supply the pans with salt water at high tide. Sloops of 40 to 50 tons also used the channel to land coal. It took approximately 6 tons of coal to boil enough water to produce one ton of salt. Salt had been an expensive commodity but when the duty on it entering Scotland was repealed in January 1823, cheap rock salt flooded the market and all Scottish salt works became unprofitable and were shut down soon afterwards. This surviving salt pan or boiling house was converted into an ice house to store local salmon catches. At present, the building is used to weigh and grade locally caught wild salmon. On the brae, above the former ice house, is the old salmon bothy. It has been converted into a house. Agates have long been collected in this area. Thomas Pennant in his " A Tour of Scotland", 1769, noted that at Usan, "agates of a very beautiful kind are gathered in great quantities beneath the cliffs and are sent to the lapidaries in London". D. H. Edwards in, "Among the Fisher Folks of Usan and Ferryden", 1921, records that, "We have on many occasions engaged in the work of 'houking' pebbles from the rocks at Usan, and we have several specially finely marked specimens. Many of the visitors have been very lucky hunters, and possess well-polished stones set in brooches, pendants and sleeve- links and ear-rings. The salmon fishers also secure not a few, one of those men having a complete outfit for cutting and polishing the stones in a snug little workshop attached to his bothy at Marywell, quite close to the ancient graveyard on the site where stood the chapel of St Mary. That the work was engaged in with success about one hundred years ago is proved by the ruins of the cottage we have already spoken of as still to be seen"'along the braes"', known as "the pebble hoose". In this humble and lonely abode, almost washed by the sea, a man lived by himself and worked as a lapidary. We believe specimens of his handicraft are to be seen in several mansions in the district - notably in Usan House, the top of a round table formed with stones of many colours, and set with fine taste and skill". Although the exact location of the Blue Hole is not known with certainty, it is widely thought to be in this general area. It may be that it was once a quarry which has has been filled in or it may have been a site which is now covered by the sea. For obvious reasons, agate collectors can be secretive about the locations for their best finds and they may create their own names for them. The Blue Hole is not marked on old maps of the area. After Dr Heddle's death, maps with his mineral collecting sites shown on them, were lodged with the Scottish Mountaineering Club but unfortunately they disappeared. Over the years, the Blue Hole has acquired almost legendary status as the source of some of Scotland's finest and most famous and agates. The exact location of the Blue Hole, however, remains a mystery.